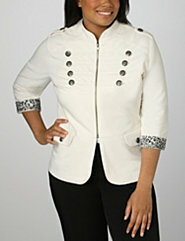 Good news for all you young fashionista’s who wished Lane Bryant would cater to the junior plus size community. Well, your prayers have been answered. On July 23rd Lane Bryant will release pieces from their Loop 18 line that caters to the young stylish curvy girls to select retail locations. Since age aint nothing but a number, some of us older stylish curvy girls can rock the Loop 18 line too. The line offers custom-fit fashion for juniors, sizes 13-27. Don’t want to wait until July 23rd, well, Sonsi.com is giving you an exclusive preview of the new line, which is available for purchase right now at Sonsi.com. Ok, so there are no original designs here. Many of the pieces are your typical basics. You know, tees, jeans, and a few dresses and cropped jackets. Also, there is an abundance of trendy prints like plaid, animal, and graphic prints. However, the line does show some promise, so, I will give it a chance and see what it develops into. You have to admit, this is a step in the right direction for Lane Bryant. In the mean time here are a few pieces that are available on Sonsi.com right now. What are your thoughts on the new line? Let’s discuss!